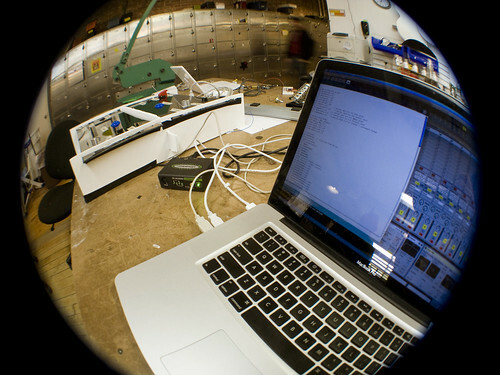 I’ve continued on work from the first social instrument I created at the beginning of the semester. With that one I wanted to make the interaction with the device as simple as possible and let the users focus on the interaction with each other instead. With this second iteration I wanted to maintain that relationship but at the same time push it a little further. This version now uses Ableton Live to generate the audio (using MIDI). The users now have some additional controls. Each have different controls available to them with the exception of a button to trigger notes being the common element between the two interfaces. On one side there are controls for: note, tempo, reverb and playback. 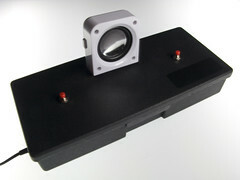 On the other side there are controls for: instrument, volume, distortion and recording. Also new in this version is a shared space. It acts as both a form of feedback as well as introducing a new social interaction. In addition to lights that indicate recording status and tempo, there will be a proximity sensor that controls pitch bend. Seeing as this will be located in the middle, it becomes a different social interaction as it is the only control that the two users have to share. With the addition of these added controls, the two users have to work harder and place an added focus on the way they communicate in order to create interesting melodies. I have been prototyping what I have so far and am now moving on to building a more permanent structure for the instrument. In doing so I am designing the interface in a flexible way so that I can easily make changes as I learn more from further user testing. I now have the laser cutting done and all of the wood cut. At this point I have a bit more sanding to do and a clear coat to apply to the enclosure. After that I just need to assemble everything and reconnect all of the wiring. Once the rest of the fabrication is done I’ll post some more documentation of the final result. In the meantime, you can see some more photos and a video that demos it’s functionality here. The Social Spotlight was created in collaboration with Boris Klompus and Miriam Simun for our physical computing midterm. 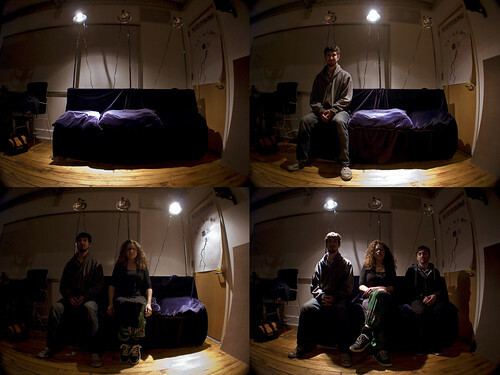 The project, consisting of a bench and three spotlights, sets the stage for social experimentation. Imagine how the setting would influence these experiments if it were to be installed in such places as subway platforms. As a user approaches the bench the spotlight above the left seat is lit, enticing the user to sit there. This is sort of stage one of the experiment. Would people want to sit in the spotlight or feel they are supposed to? Would they be too shy and sit in one of other seats or avoid the bench all together. Once someone sits in the spotlight, that light turns off and the middle light turns on. As the etiquette of social norms in this type of situation may suggest, one would normally leave a seat in between empty before sitting down. With the middle spotlight turning on, the bench suggests otherwise. With the middle seat taken, the last spotlight lights up. Once the bench is fully occupied, the light above the first person to sit down turns back on again. This leads to new observations. Does the person under the spotlight feel awkward in this situation? Do they feel as though they are meant to get up? How do others sitting on the bench respond? The interest in how the answers to these questions change from user to user and location to location was one of the biggest factors in leading us to develop the project. Here are a few more photos and a video below to demo how it functions.